This section is for pins and pinback issues such as American Pepsin, Sweet Caporal, Little Jockey and many more. 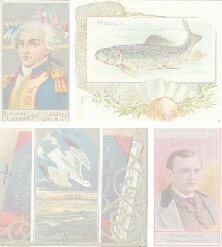 Flags, actresses and many other topical subjects were produced in pinbacks and used for inserts into products from the late 19th century on. 7 7 COWBOY AND INDIAN METAL PICTURE BUTTONS 1930'/40'S? BIFF BANG BONG! Archived threads from 2006. 1495 214 What else do you collect? Most users ever online was 270 on 1555969743 .